Are you fascinated by weird or strange facts? We are too! National Geographic Kids Weird But True! has a website that offers kids (and grownups) the chance to explore all the strange and out of the ordinary things in life. 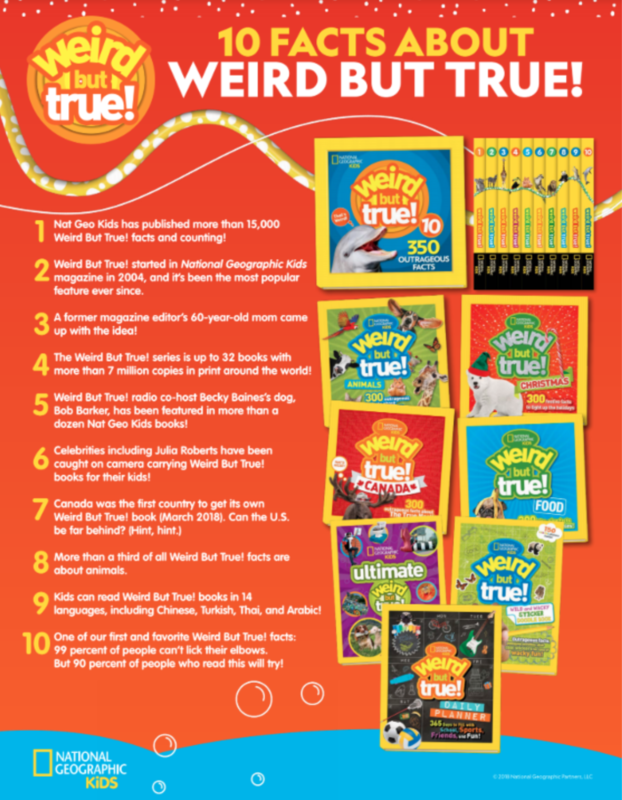 If you're looking for some fast facts fun anywhere or anytime then you'll want to grab one or all of these fun books that feature the Weird But True! Check it out below and enter for a chance to win a Weird But True! Mega Prize Package. The latest release in the main Weird But True! series and books 1-9 has been refreshed and expanded to include 50 MORE facts than the original releases (that’s 350 facts per book if you are counting!)! Did you know that ears are self-cleaning, or that itching is contagious? It's all totally weird ... but true! Each of the ten books of this main series contains 350 surprising and amazing facts about topics like science, space, weather, geography, food, pop culture, and just about everything else under the sun, presented with fascinating photos and illustrations. The newest in the WBT book family, WBT Know-It-All focuses on specific topics structured into profiles. Weird But True! Know-It-All Greek Mythology includes everything kids need to know about all their favorite Greek gods, heroes, monsters, quests, muses, and famous philosophers. From who gave mankind fire to famous fatal flaws to who stood guard at the Underworld, this book includes all the iconic Greek myths and key characters — and then goes one wonderfully weird step beyond. ds learn new information and get to try new wacky activities, from doodling prompts to crosswords, mazes to picture puzzles. This book unleashes kids' creativity in a uniquely Nat Geo Kids way. Discover amazing weird facts and then doodle, draw, or color away right on the page. Did you know that some American soldiers once rode camels instead of horses? Draw some other unexpected animal mounts! Did you know that some ice-cream trucks serve scoops just for dogs? Create some other gourmet masterpieces for your canine companion. Enhance your wacky masterpieces with 150 fun stickers included in the book. Let your kids’ creativity run wild for hours on end in this perfect boredom-buster for rainy days, car rides, or any time. A bit different than the main Weird But True! series, this title is focused on one theme — spreading holiday cheer with festive far-out facts about Christmas! Makes a terrific stocking stuffer. Explore all the Weird But True! books and tell me in the comments which one you'd like to read! National Geographic Kids Weird But True! Mega Prize Pack includes a total of THIRTEEN books and a tote bag! (ARV $130) Weird But True! books 1-10; Weird But True! Know-It-All Greek Mythology; Weird But True! Cool and Crazy Sticker Doodle Book; Weird But True! Christmas and a handy Weird But True! bag to carry groceries, toys, or this big haul of books! 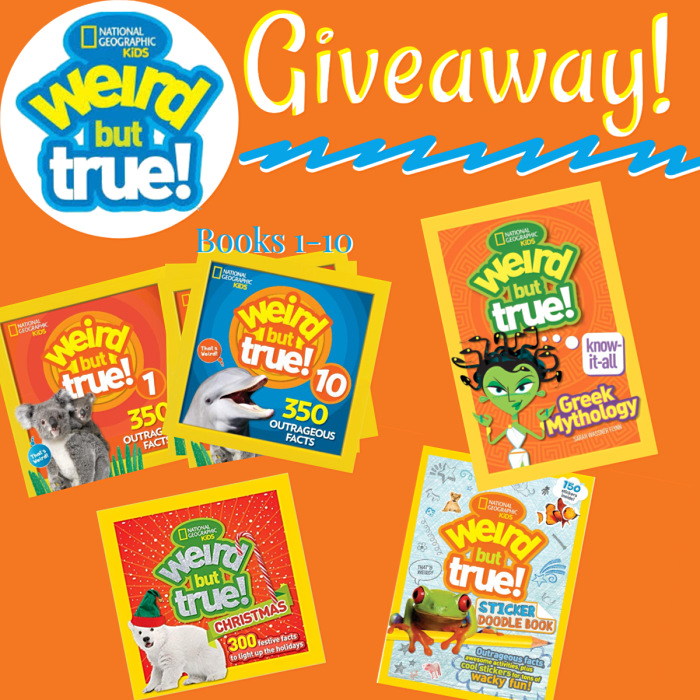 One lucky entrant selected by the entry form will receive the National Geographic Kids Weird But True! Mega Prize Package! Open to entrants in the US, 18 years and older. Open for entry from 11/2/18-11/16/18 at 11:59pm EST. The winner will have 24 hours to respond to the notification email to claim this prize or a new winner will be selected. The Mommy Island and participating bloggers are not responsible for sponsors that fail to ship their prizes. Good Luck! These are so interesting and informative. I'd like to read the Weird But True Daily Planner. My son would like to read the Weird But True Sticker Doodle Book. I would love to read the Weird But True Christmas book. I love all of their selections! Thanks for the super giveaway opportunity. I would like to read Weird But True Christmas Version. It is after all approaching the holiday season. I saw that they had a game on their site called Crack The Code. That game sounds like a lot of fun to me. I would like to read the Weird but True 300 Outrageous Facts. I have always loved Greek mythology,so that one would be my first pick. I'd like to read the Weird but True USA book! I think presidential fun facts would be a good one to read!! Ye Olde Weird But True looks super fun. Oh they all look so good and fun to read! I think the Weird But True Christmas would be so fun to read this time of year! Weird But True Christmas: 300 Festive Facts to Light Up the Holidays. I would like to read, Weird but True US Presidents. I would like to read with the kids the Ultimate Weird But True book. I would like to read the Ultimate Weird But True. I think the 1000 Wild and Wacky Facts book would be the first one to get. I think my granddaughters would like the Weird But True Christmas book. Weird But True: Human Body would be a good one to read. The Weird But True Know-It-All: U.S. Presidents looks interesting! My kids would be interested in "Weird but True Sports"
I like the Sticker Doodle book. My kids would like to read the title Weird But True! USA.